We offer an extensive array of products made from crystal, glass, wood, marble, and metal. Here's some additonal information on these materials. 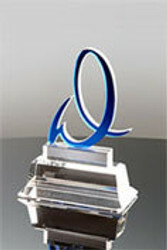 Glass: We design and manufacture a wide variety of stock, semi-custom and custom glass awards. Glass for most awards starts as large sheets of glass (picture an extremely large pane of window glass). These large sheets of glass are cut into various shapes and sizes to create the components of a glass award. 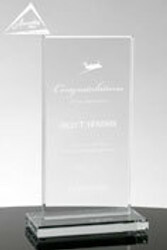 Glass for awards come in varying thicknesses, from .375" thick to .75" thick. 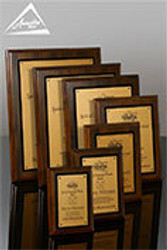 Varying thicknesses are used to create awards of various sizes, designs, and price ranges. The glass for awards is actually called "float glass" because it is made by "floating" molten glass on a bath of molten metal (typically tin). As the glass flows onto the surface of the metal, it creates a floating ribbon of glass with uniform thickness and perfectly smooth sides. The temperature of the ribbon is gradually cooled so that the glass hardens. It then passes through a kiln to anneal the glass (so it doesn't crack in temperature changes). After this it is cut into sheets of various sizes. The raw materials used to make glass include sand, sodium carbonate, limestone, sodium sulfate, dolomite and a few other additives. The materials must be heated to 2400 degree Farenheit to turn them into molten glass. At this stage the glass is so hot it looks white. Most glass awards are either clear in color (sometimes also called Starphire) or jade (which is light green tint to the glass). Watch a short video we made about Jade Glass. Glass can also come in a black color. The green tint in glass comes from iron used in the "recipe" for the glass. Iron acts as a lubricant that keeps the molten glass from "sticking" to the molten metal that it moves over as it cools. Every glass manufacturer has a different recipe for their glass, so you will find that glass ranges from very clear, to varying shades of jade coloring. In general, jade glass is easier to process and therefore is less expensive than clear glass. The glass that is clearer (and therefore has less iron in it) is more difficult to process (it is "stickier") and generally is more expensive. 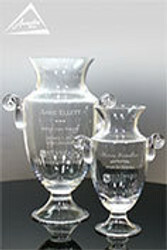 However, the end price of a glass award is more about the size, thickness, shape and number of components. Art Glass: Art glass has beautiful colors and shapes, and is popular for a wide variety of award and gift categories. 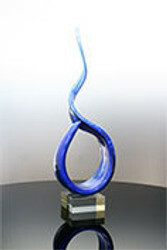 The art glass used for awards are hand blown glass pieces. Watch a short video we made to explain art glass. A molten "blob" of glass, called a "parison" is attached to the end of a long tube, called a blow pipe. The artist blows air through the pipe and into the glass, and then spins and works the glass into a multitude of beautiful shapes. By moving the blowpipe around as they work on the glass, they are actually cooling the glass to be able to work into various shapes and objects. As the artist works with the glass, additional color pieces can be added to the piece to create a range of colors. Glassblowing actually involves 3 separate glass furnaces. The first one holds the molten glass at approximately 2000 degrees Farenheight. The second is called the "glory hole" and is used by the artist to reheat a piece as they work and rework the glass into the desired shape. The last furnace is called the annealer, which is used to slowly cool the piece. Cooling the piece can take several hours to several days depending on the size and shape of the design. Cooling slowly keeps the glass from stress cracking (which happens if cooled too quickly). Colors and patterns are added to the art glass through a number of methods: rolling the piece in powdered color, or by adding larger pieces of colored glass called "frit". Sometimes rods of colored glass are added to the piece (called "cane"). Cane gives the glass a striped looked. Because art glass pieces are hand blown and each piece is made individually, there will be variations in color, size and shape, making these truly unique and one of a kind awards and gifts. Recycled Glass: Recycled glass has become increasing popular for sustainability programs. 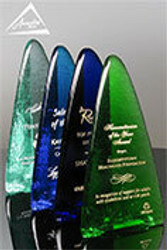 Recycled glass awards are made from post consumer and industrial glass waste. 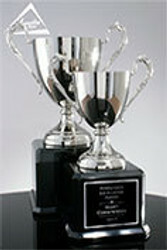 The glass for these awards generally comes from the glass recycling programs in communities across the US. All our recycled glass awards are made by glass makers in the United States that specialize in recycled glass manufacturing. Most recycled glass awards are made by pouring molten glass into molds of various shapes and sizes. The glass is then cooled and removed from the mold for final polishing. Because recycled glass awards are made from glass that has been previously processed, the processing time for melting the glass takes longer, and the glass is more difficult to work with. 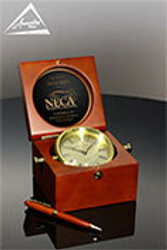 This generally means that recycled glass award molds are simple, classic shapes that allow the glass to cool uniformly. The processing for recycled glass pieces will often produce air bubbles, folds and wrinkles in the glass that happen during the pouring and cooling process. These elements generally add interest to the pieces and make them more unique than standard glass awards. Recycled glass in its natural color is a light green shade, as it picks up on the iron content used in the original glass. Other colors can be added to recycled glass: blues, yellows, oranges are most common. 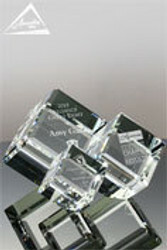 Crystal: is a very popular choice for corporate and association awards. 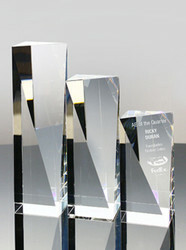 There are basically two types of crystal used in the manufacture of awards: optic crystal, and lead crystal. Watch a short video we made to explain the difference between Optic and Lead Crystal. Optic crystal is an extremely high grade of crystal. It is called Optic Crystal because it is the same grade of material used to make lenses for cameras, microscopes and other optical equipment. Optic crystal is 100 % lead free. The absence of lead makes optic crystal extremely hard, which makes it perfect for creating gorgeous bevels and cuts, and highly polished surfaces. Optic crystal is produced in sheets of molten material, in the same manner as glass. However, optic crystal can be produced in sheets up to three inches thick. Before the crystal cools and hardens, it is subjected to extreme pressure to remove any air bubbles or flaws. Optic crystal can be polished, cut and beveled by machine or by hand. Lead Crystal is widely used for cut crystal vases, bowls, pitchers and decanters and for fine drink ware. Lead crystal is made by adding lead oxide to the raw materials, which gives the material an greater level of "sparkle" and brilliance as it hardens. The piece is then cut and polished. The lead oxide also makes crystal softer than glass and allows it to be hand cut and beveled with brilliant edges. The higher the lead oxide content, the more expensive the crystal, with 24% the highest level attainable. Because lead crystal is softer than optic crystal,it can be poured into molds to create various shapes that can not be attained with crystal sheets. Marble: marble is often used for the bases of awards, and also as a decorative element on plaques. Marble is actually a rock formed from primarily sedimentary limestone or dolomite. Over hundreds of years, layers of this sediment fuse together (through pressure and heat) to form a variety of harder colored marble which can be cut and polished for a variety of uses. All marble has characteristic veining, swirls, and grains of other materials throughout the product. These elements are the result of other minerals that were originally present in the sediment as the rock hardened into marble. Marble can be found on most continents, and varies in color due to the local soil configuration. White, pink, grey, green, and black are the most common colors found. Wood: A wide variety of wood types and wood finishes are used for plaques and the bases for awards and vases. 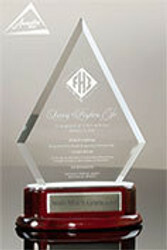 Solid Hard Woods: a variety of hardwoods are used in the manufacture of plaques and bases for award and gift products. Most hardwoods used at Awarding You are harvested, cut and finished in the US. Common hardwood varieties are: Walnut, Cherry, Oak, Maple and Alder. Most hard wood plaques are finished with a stain and satin finish top coat for durability. Plaques can be cut in a variety of shapes, and finished with a variety of edge detail. Piano Finish Plaques: piano finish refers to the high gloss finish of the plaque top coat. This finish is actually created with between 10 and 20 layers of clear lacquer (similar to the finishing done on grand pianos). Sustainable Woods: we offer Red Alder sustainable wood plaques. We offer Red Alder plaques, photo frames and desk wedges which are made in the USA. Red Alder is a sustainable hardwood which grows rapidly in its juvinile stage and is replanted once harvested. Let us know if you would like us to help you design an award using sustainable materials. Wood Finish Materials: Many lower cost plaques are actually made of a pressed wood interior and then covered with either a wood veneer or wood foil product. These offer a similar look to solid wood products, but a much lower price point. Wood finishes are available in a variety of wood shades including: cherry, walnut, oak, and black.